Running an oil and gas company can’t have been the best time either. But the pay helped — a point that hasn’t been lost on investors. Toward the top left is shareholder paradise, with relatively high returns but relatively modest bonus payouts; the opposite corner is less desirable. About a third of the companies hug that diagonal line pretty closely, meaning returns and bonus levels are more aligned, in relative terms. Companies like EOG Resources Inc. look extremely attractive while the likes of EQT Corp. — which was targeted by activists and whose CEO resigned in March — less so. 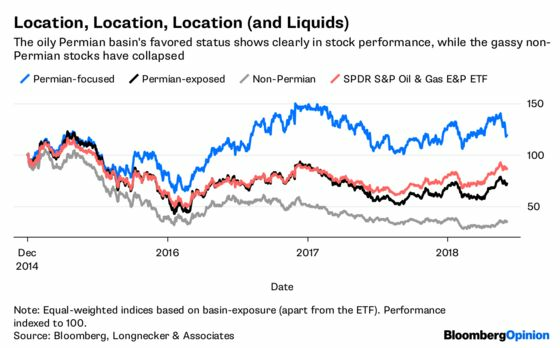 One point that jumps out is that companies focused on the Permian basin generally screen much better, especially compared with those with no exposure. 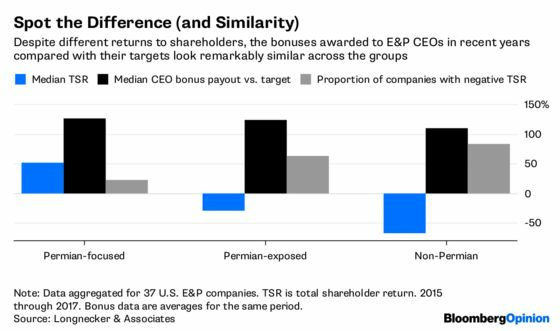 While it’s too simplistic to praise or condemn each company based on this snapshot, the vast differences in relative returns compared with the striking similarity in bonus payouts across the subgroups is exhibit A for why short-term incentives are receiving attention. As a whole, only 15 of these 37 companies generated a positive shareholder return during the period. 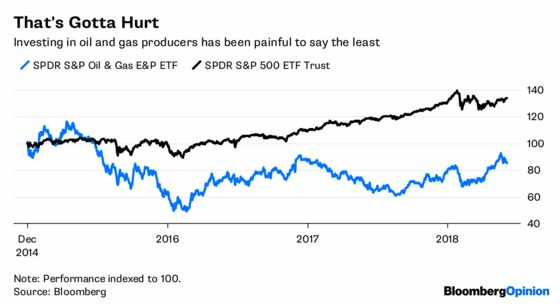 On a relative basis, only 17 beat the SPDR S&P Oil & Gas Exploration and Production ETF, and just six beat the SPDR S&P 500 ETF Trust. Yet 30 of them paid their CEOs at least 100 percent of their target bonus on average during the period. The primary culprit is a historical focus on growth over returns. 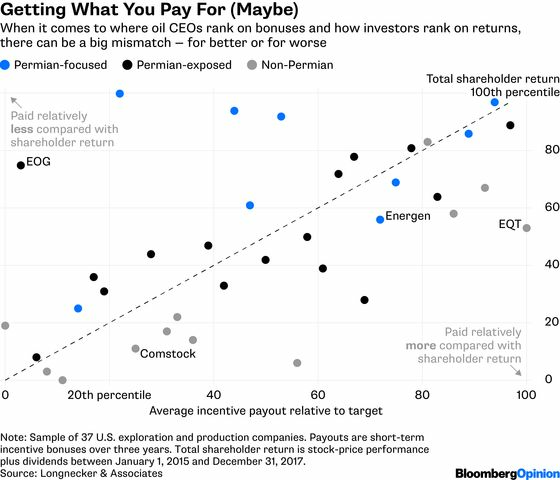 This features prominently, for example, in the bonus criteria of Comstock Resources Inc., which I profiled here the other day and, you’ll notice, sits in that less desirable half of the graphic above. Last year, fully 60 percent of Comstock’s CEO bonus was tied to growing reserves and production, chiefly of natural gas — not a market exactly crying out for more supply. It is notable that for the benighted non-Permian group, 70 percent of its production last year was lower-value natural gas, according to figures compiled by Bloomberg. One thing worth noting is that sharp recent dip in the Permian-focused stocks. Investors are fretting about the discounts being taken on barrels there as surging production runs into logistical bottlenecks.